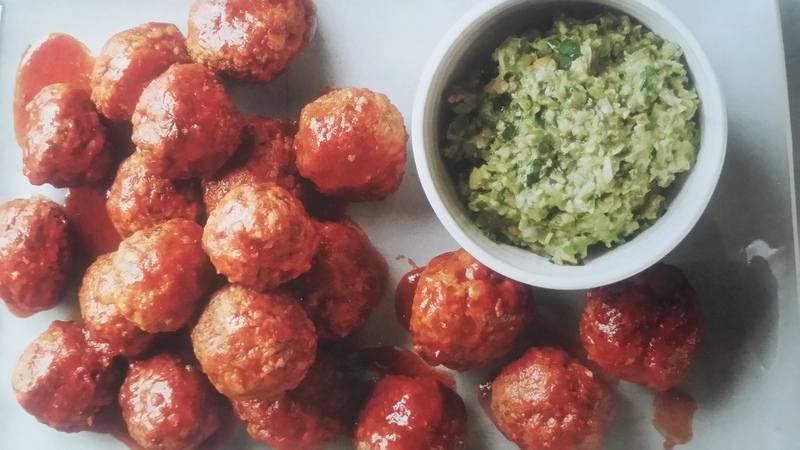 Taken from Food Network Magazine from a couple years ago, these meatballs will be a hit at your next gathering! Add the pimientos, breadcrumbs, egg and salt; mix with your hands until combined. Dampen your hands and form into meatballs 1 1/2″ (I have a meatball scoop that I use). This will make about 24 meatballs. Heat the olive oil in a large nonstick skillet over medium high heat. Add the meatballs and cook, turning, until browned on all sides, about 5 minutes. Transfer to a plate. Add the tomato paste to the skillet and cook, stirring, until slightly darkened, about 1 minute. Add the chicken broth, brown sugar and vinegar and cook, stirring until the sugar dissolves. Return the meatballs to the skillet; reduce the heat to medium and simmer, occasionally spooning the liquid over the meatballs until the liquid is reduced by half and the meatballs are cooked through, about 30 minutes. Transfer to a platter and serve with the reserved tapenade.